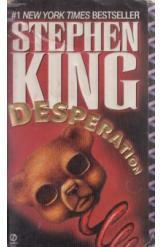 Desperation by Stephen King, Sci Fi. The ghost town of Desperation, Nevada, has been overtaken by a murderous entity. The demon abducts a series of travellers from the nearby highway, and they must work together to defeat the creature and escape Desperation. Book is in good condition, all pages intact.